Flowering spring bulbs bring colour, vibrancy and life to the garden, so what better Christmas gift for your nearest and dearest than a bowl of these beautiful blooms – or why not treat yourself? Hyacinth jars have an hourglass shape. Its pinched-in waist supports the bulb just above the water sitting in the bottom half of the jar. Finished with a bow this simple gift promises to pack a powerful punch of colour and scent. Just like hyacinths, potting soil isn’t essential when growing paperwhites. Try planting the bulbs in a clear vase filled with coloured glass beads, or fill urns or planters with beads or gravel. Nestle the bulbs in position so that one third to a half of each bulb is still visible. Don’t be afraid to pack them in; this way you’ll guarantee a display with real impact. Fill the bowl with water so that the base of the bulbs only just touch the water. Once the roots appear you can drop the water level so it isn’t touching the bulbs. Also known by their botanical name Hippeastrum, the amaryllis is the last word in bold and brazen beauty. 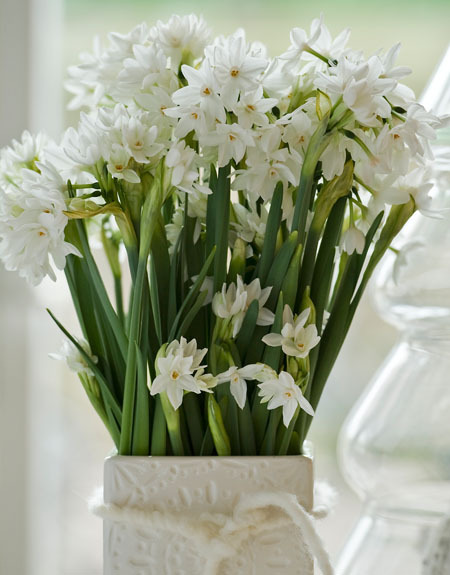 It is the traditional bulb for Christmas giving, with its larger-than-life trumpet blooms in many colours. No one receiving an amaryllis will be left disappointed! Accessorise potted amaryllis by adding a luxurious bow, cut winter stems of dogwood or willow, or by planting the bulb with foliage plants such as English ivy and ferns for added interest. Keep the bulbs lightly moist while they settle in, then water more regularly as they start to grow – once a week is about right. Amaryllises thrive at a warm room temperature of 70 degrees Fahrenheit or 21 degrees Celsius, but can be moved into a cooler room to prolong the life of the blooms.